The William and Kate Dunwoody Legacy Association recognizes donors who generously provided for Dunwoody College through their wills, trusts, gift annuities and other deferred gifts. In his final will and testament, William Hood Dunwoody laid the groundwork for today's achievements: "...it is my purpose and desire to establish and endow a school wherein shall be taught industrial and mechanical arts, giving special importance to handicrafts and useful trades." 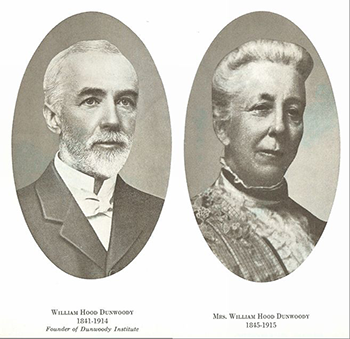 Kate L. Dunwoody likewise included a major portion of her estate to support the school that her husband established through his bequest a year prior. The Dunwoody Legacy Association recognizes a planned gift of any amount that benefits the College. Most planned gifts provide unrestricted support for the greatest needs of the College. Planned gifts may be restricted as identified in a Fund Agreement for scholarship, a program or project. Dunwoody Legacy Association members are honored for their vision and commitment. They receive invitations to gatherings, are listed in the Annual Report and on the donor wall. The College will respect those who request anonymity. Are you ready to put your talent to work? © Dunwoody College of Technology. Copyright notice and privacy statement.